The final version 1.0 of FaceTime for Mac is now available on the Mac App Store. It also supports HD video calls on the new supported Intel Macs. 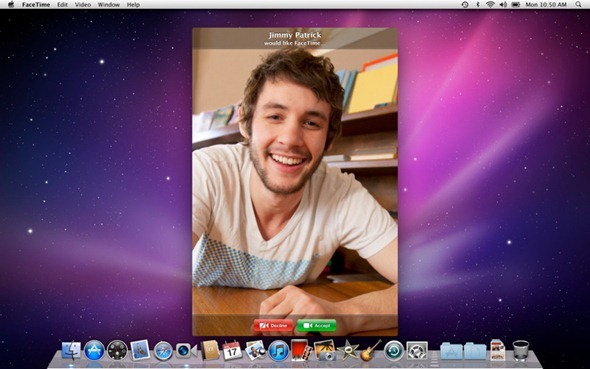 FaceTime for Mac makes it easy to talk, smile and laugh with friends and family on their iPhone 4, iPod touch or Mac. Getting started is quick and easy — simply enter your Apple ID and you’re ready to go. Whether you’re talking to someone on an iPhone or on another Mac, video calls with FaceTime look great. There’s no better way to stay in touch with all your favorite faces. *Video calls require a built-in FaceTime camera, an iSight camera (built-in or external), a USB video class (UVC) camera, or a FireWire DV camcorder; and a 128-Kbps upstream and downstream Internet connection. Making HD video calls requires a built-in FaceTime HD camera and a 1-Mbps upstream and downstream Internet connection. Receiving HD video calls requires a supported Intel-based Mac. Available for $0.99, FaceTime for Mac can be downloaded from the Mac App Store.